Formerly known as the Bruce Nuclear Power Development (BNPD), the facility was constructed in stages between 1970 and 1987 by the provincial Crown corporation, Ontario Hydro. In April 1999 Ontario Hydro was split into 5 component Crown corporations with Ontario Power Generation (OPG) taking over all electrical generating stations. In June 2000, OPG entered into a long term lease agreement with private sector consortium Bruce Power to take over operation. 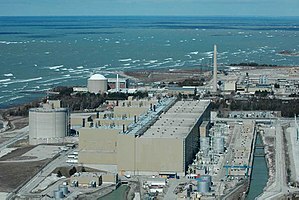 In May 2001, Bruce Power began operations. The lease is for 18 years until 2019 with an option to extend another 25 years to 2044. In November 2009, the Canadian Nuclear Safety Commission (CNSC) renewed Bruce Power's operating licences for 5 years until 2014, and gave permission to refuel units 1 and 2. In May 2014, the CNSC extended the licence to May 2015 and public hearings were scheduled for early 2015 in Ottawa and Kincardine. A new operating licence was granted for June 1, 2015, until May 31, 2020. Bruce Nuclear Generating Station is a nuclear power station located on the eastern shore of Lake Huron in the communities of Inverhuron and Tiverton, Ontario in Canada. It occupies 932 ha (2300 acres) of land. The facility derives its name from Bruce Township, the local municipality when the plant was constructed, now Kincardine due to amalgamation. Its eight reactors are arranged into two plants (A and B) with four reactors each. Each reactor stands within a reinforced concrete containment, driving eight steam generators. The steam generators are 12 m tall, and weigh 100 tonnes each. Each plant uses three fueling machines, shared between the four reactors, which travel in a duct cut through solid rock beneath the reactors, traversing the entire plant. The duct doubles as part of the pressure relief system, connected to the vacuum building. Each reactor has its own turbine generator set, with one high-pressure turbine and three low-pressure turbines driving one generator. The turbine hall is about 400 m long at each plant and houses the four turbine generator sets. Cooling water is taken from Lake Huron. There is (originally) one control room per 4 reactors. Construction of Bruce A began in 1969, making it the successor to the Pickering A plant. Bruce A units were originally rated at 750 MWe net / 805 MWe gross, which was later increased to 769 MWe net / 825 MWe gross. As of 2017[update] the Bruce A units were capable of producing up to 779 MWe net according to IESO generator data. Each reactor requires 6240 fuel bundles that weigh 22.5 kg each, or about 140 tonnes of fuel. There are 480 fuel channels per reactor, containing 12 bundles each. There is storage capacity for about 23,000 bundles. Approximately 18 bundles are discharged per reactor per day. The Bruce A steam generators utilize a separate large horizontal shared steam drum (with one steam drum common to four steam generators), a design dropped in most other plants at the time. Issues related to the AECL requested design of the tube supports caused repair and delay costs, which exceeded the net worth of the builder Babcock & Wilcox Canada. Until they were removed in 1998, Bruce A reactors used unique booster rods to control reactivity. Booster rods contained 93% uranium-235, and were inserted to overcome xenon poisoning. Bruce B and all other Ontario Hydro reactors instead use absorber rods called "adjusters" which are normally inserted and are removed to overcome xenon poisoning. Bruce A demonstrated an "excellent" early operating history. Together with Pickering A, the eight units achieved an overall average capability factor of 83% over the initial five-year period. However, by 2001, when Bruce Power took the lease, all Bruce A units were laid-up. In 1981, Unit 1 was ranked the top reactor in the world with a 97% availability factor. In December 1997, after about 20 years of operation, it was out of service. In 2005 (after 7 years of being idle) refurbishment started. In September 2012 (15 years out of service) it resumed operation. In 1982, Unit 2 was temporarily shut down due to a pressure tube leak. In 1986 a fuel channel failed while the reactor was shut down; some of the fuel elements were swept into the moderator (calandria) and were difficult to remove. In 1986, maintenance workers accidentally left a protective lead blanket in the steam generator of Unit 2. By the time the mistake was discovered six years later, the blanket had melted, severely damaging the boiler. In October 1995, after about 18 years of operation, unit 2 was out of service. In 2005 (after 9 years of being idle) refurbishment started. In October 2012, it resumed operation. Construction started 1 July 1972. On 28 November 1977 it reached first criticality. Commercial operation began on 1 February 1978. In 1982, Unit 3 set a then world record of 494 days of continuous operation and as of 1984[update] Bruce A was the most reliable multi-unit station in the world. From April 1998 onward it remained idle for 6 years, returning to service in January 2004 (unit was 32 years old). Planned refurbishment to begin in 2023 (unit will be 51 years old). Construction started 1 September 1972. On 10 December 1978 it reached first criticality. Commercial operation began on 18 January 1979. In 1990, a software error caused a fueling machine error, damaging a fuel channel. In 1993, reactor power was reduced to 60% until various loss-of-coolant accident (LOCA) scenarios could be addressed. Subsequently, Bruce A units returned to 89% of rated power. In March 1998, after about 19 years of operation it was out of service. In October 2003, after 6 years of being idle, it returned to service (unit was 31 years old). Planned refurbishment to begin in 2025 (unit will be 53 years old). Bruce B units are of a slightly larger capacity: 817 MW net, 840 MW gross. which is attributed to an improved steam generator design, where the steam drum is integral to each steam generator in a "light bulb" arrangement, eliminating the horizontal cross-drum. In 1990, a nine-week "impairment" of Bruce B was created when a technician incorrectly set the calibration on radioactivity monitors. In 2007, Bruce B 7 was the top performing nuclear reactor in Ontario with 97.2% performance. and in 2009, Bruce B 5 was first with 95.4% performance. Construction began 1 June 1978. On 15 November 1984 it reached first criticality. Commercial operation began on 1 March 1985. Originally scheduled to be shut down in 2016 (unit would have been 31 years old). Planned refurbishment to begin in 2026 (unit will be 41 years old). Construction began 1 January 1978. On 29 May 1984 it reached first criticality. Commercial operation began on 14 September 1984. Originally scheduled to be shut down in 2018 (unit would have been 34 years old). Planned refurbishment to begin in 2020 (unit will be 36 years old). Construction began 1 May 1979. On 7 January 1986 it reached first criticality. Commercial operation began on 10 April 1986. Originally scheduled to be shut down in 2015 (unit would have been 29 years old). Planned refurbishment to begin in 2028 (unit will be 42 years old). Construction began 1 August 1979. On 15 February 1987 it reached first criticality. Commercial operation began on 22 May 1987. Originally scheduled to be shut down in 2019 (unit would have been 32 years old). Planned refurbishment to begin in 2030 (unit will be 43 years old). 2013 45 TWh, which was about 30% of Ontario's production. As of 2008, the Bruce station had three double-circuit 500 kV transmission lines to feed the major load centres in southern Ontario, in addition to three double-circuit 230 kV lines serving the local area. These circuits are connected via two high voltage switchyards owned and operated by Hydro One. In 2006, OPA had proposed increasing transmission line capacity, at a cost of between $200–600 million, described as "the largest electricity transmission investment in Ontario in the last 20 years." The line was completed in June 2012, several months ahead of schedule, with over 700 towers built for the 180 kilometre line to Milton. The project ranked 45th in Renew Canada's annual list. In 2010, Bruce Power was paid approximately $60 million for contracted, but unused power. Compared to the previous Pickering station, the Bruce reactors have higher power output, achieved by: increasing the number of fuel channels, increasing the number of bundles per channel, and a change in the fuel bundle itself. At Bruce, the fuelling equipment is shared by the four reactors of each plant, while at Pickering each reactor had a fuelling machine. The Bruce fuelling machine and fuel channel end fitting design (mostly by Canadian General Electric) is based on the Nuclear Power Demonstration design. The Pickering design by AECL was based on Douglas Point. The building design of the reactor differs: Bruce uses a squarish "close-in" design, in which as much of the equipment as possible is arranged outside the main containment envelope for easier access during maintenance and emergencies. The steam generators penetrate the containment. The primary coolant pumps and primary piping systems are inside the containment enclosure, but the pump motors are outside containment and the drive shaft seals form the containment boundary. Pickering has round domes which enclose much of the secondary cooling equipment. The Pickering A system did not originally have a second independent shutdown system. The Bruce containment concept differs: the reactor's reactivity mechanism deck serves as a part of the containment boundary, is closer to the reactor, and more prone to damage in the event of an accident ("accidental physical disassembly"). The designers therefore foresaw the need for a second safety system to reduce the risk on an accident. Bruce received a second, fully independent Safety Shutdown System (SDS2) which uses a liquid neutron poison injection method. The Bruce system also has a high-pressure Emergency Coolant Injection System (ECIS). Each Bruce "4 pack" has its own Vacuum Building, while Pickering has one per eight reactors. At Pickering, the vacuum duct was closed by nonreturn valves, to prevent flow of the steam/air mixture from the duct to a non-accident reactor unit following a LOCA. In the Bruce concept, there is no such non-return valve; the reactor buildings are all interconnected during normal operation. Bruce uses single-circuit heat transport system, while Pickering had two circuits. The first two reactor units of Pickering A originally used Zircaloy-2 pressure tubes. All subsequent CANDU units use a zirconium - 2.5% niobium alloy. The Pickering design utilized 12 small steam generators operated in groups of three which can be individually valved out of the heat transport loop, as can the 16 pumps per reactor, with 4 being spare. At Bruce, the number of steam generators and coolant pumps was reduced to 8 and 4 respectively, without any spare pumps, thereby simplifying the piping. The Bruce system permits reactor power level to be adjusted more quickly and easily. Bruce A was projected to cost C$0.9 billion (1969), and actually cost $1.8 billion (1978), a 100% over-run. Bruce B was projected to cost $3.9 billion (1976), and actually cost $6 billion (1989) in "dollars of the year", a 50% over-run. These figures are better than for Pickering B or Darlington (at 350%, not accounting for inflation). On January 1, 2016, Bruce Power began receiving a single contracted price for all output from the site of CA$65.73 per megawatt-hour (MWh). This price is partially adjusted annually to account for inflation and wage growth, with additional monthly fuel cost adjustments, and it includes a small payment for Bruce's unique ability to curtail up to 2400 MW of generation (total across all eight units — up to 300 MW per individual unit) via steam bypass operation during periods of surplus generation. During the course of the refurbishment of Units 3–6 the price will be raised in steps to cover individual reactor refurbishment costs, with each increase starting 12 months prior to the start of each individual refurbishment (and lasting only until that unit's refurbishment costs (which are fixed prior to refurbishment start) have been recovered). The average price per MWh that will be paid to Bruce Power for all electricity generated from 2016–2064 (covering the entire refurbishment period for Units 3–6 plus the entire expected remaining post-refurbishment lifetimes of all eight Bruce Power reactors (including the two that were already refurbished)) was estimated to be approximately CA$80.6/MWh in 2017 dollars by the Financial Accountability Office of Ontario. In contrast, the estimated average price of nuclear electricity from all three Ontario nuclear plants during that same 2016–2064 period was estimated to be CA$80.7/MWh in 2017 dollars, the 2017–2018 unit cost of Ontario nuclear power was CA$69/MWh, and the current price of electricity for "most residential and small business customers" was CA$114.9/MWh (prior to the Fair Hydro Plan) or CA$97.6 (after the Fair Hydro Plan). During the Northeast Blackout of 2003 three Bruce B units continued running at 60% reactor power and 0% grid electrical power. They were able to do so for hours, because they had steam bypass systems designed to de-couple the reactor output from the generator electrical output. The three units were reconnected to the grid within 5 hours. Bruce A and B stations were designed to operate indefinitely while disconnected from the grid. "Contrary to popular belief, the electrical generators of nuclear plants can follow the load demands of the electrical grid provided specific engineered systems to permit this mode of operation are included in the plant design." Cobalt-60 (60Co) can be produced in a CANDU reactor by using adjuster rods made primarily out of 59Co (instead of the normal stainless steel), which is slowly transmuted into 60Co via neutron activation (59Co + n → 60Co). These now-intensely-radioactive cobalt-60 adjuster rods are then "harvested" (removed and replaced with fresh 59Co adjuster rods) after one to three years of use in the reactor during a routine reactor shutdown, and are later processed into sealed 60Co sources of varying intensities by Nordion. The Bruce nuclear power plant has been producing 60Co since the 1980s, and almost all of the world's supply of 60Co comes from various CANDU nuclear reactors, with Bruce being the single largest supplier. As of 2007[update], Bruce supplied over 40% of the world's 60Co. This rose to over 50% by 2016, with Pickering supplying approximately another 20% of global demand. In 2016 Bruce extended their contract with Nordion for the continued supply of 60Co to cover the entire projected post-refurbishment life of the Bruce reactors, which are expected to operate until 2064. Bruce also began producing High Specific Activity (HSA) 60Co in 2016, which is designed for highly specialized medical uses such as cancer treatment and had been primarily produced at the NRU reactor for the past 60+ years (which was originally scheduled to be shut down in 2016, but will be kept online until March 31, 2018 due to the general worldwide lack of sufficient replacement medical isotope production capacity for several critical isotopes such as molybdenum-99). As the NRU produces over two-thirds of the world's HSA 60Co, Bruce's ability to supply HSA 60Co will become critical to help fill the immense production gap left by the NRU once it is decommissioned in 2018. OPG and Bruce Power are collaborating on an effort to expand 60Co production to the Bruce A and Darlington reactors in order to fully cover Pickering's production (which will end when the plant is decommissioned in 2024) in addition to the inevitable gaps in 60Co production capacity that will be caused by the upcoming refurbishments of six of Bruce's reactors (Units A 3–4 & Units B 5–8), as well as all four of Darlington's reactors. They are also working on expanding the production of HSA 60Co to more reactors. In 2017 Bruce Power became the first Canadian recipient of a Top Innovative Practice (TIP) award from the Nuclear Energy Institute (NEI) for its ongoing work with Nordion to produce cobalt-60. Bruce Power is working with Framatome to develop the capability to "produce shorter half-life radioisotopes (such as molybdenum-99, lutetium-177 and iridium-192)" using Areva's proprietary technology for the on-line production of radioisotopes in heavy water reactors. Areva will design and supply the system for installation in the existing Bruce units. In June 2018, Bruce Power and ITG (a subsidiary of Isotopen Technologien München (ITM)) announced the start of a joint effort to explore producing lutetium-177 in Bruce's reactors, with ITG planned to manage the development, processing, and distribution of lutetium-177. Retubing of Bruce A units was planned in 1992, but deferred, as Ontario Hydro had a surplus of generation at the time. In late 2005, Bruce Power and the Government of Ontario committed to return units 1 and 2 to service, in order to help meet increasing energy demand in the province of Ontario. The project was originally estimated to cost $4.25 billion. It was determined that while Units 1 & 2 could have been restarted without refurbishment, it was economically advantageous to do so, since refurbishment would have been required shortly thereafter. The goal is to keep Units 1 & 2 in service until 2043, 66 years after original commissioning. The refurbishment required pressure tube and calandria tube replacement, steam generator replacement, shutdown System 2 (SDS2) enhancement, an upgrade of turbine control systems, replacing original analog controls with a DCS and significant other work and maintenance (for example, replacement of 30 transformers containing PCBs). A new fuel bundle design (Low Void Reactivity Fuel, LVRF) was considered, using slightly enriched (1% U-235 fuel pellets, within a CANFLEX 43-element bundle compared to the existing 37-element bundle. In 2006 and 2007, the restart project was judged to be the largest infrastructure project in Canada by ReNew Canada magazine. In April 2007, the auditor general reviewed the refurbishment deal  In August 2007 estimated cost for the project had grown to $5.25 billion when Bruce Power decided to replace all 480 fuel channels in Unit 4, which will extend its working life to 2036, in line with the other 3 units of Bruce A. In 2008, due to difficulties developing the necessary robotics, the estimated cost of restarting Units 1 and 2 rose between $400 and $700 million. As of 2008, the project remained on schedule. In January 2010, up to 217 workers were potentially exposed to radiation during the refurbishment. 27 workers may have received 5 mSv, a level well below the level that can affect human health. Only one lab in Canada (at Chalk River) was qualified to do the testing. Bruce Power had to seek permission to use alternative labs. In 2010, a plan to ship decommissioned, low-level radioactive steam generators to Sweden via the Great Lakes caused controversy. The CNSC approved the plan in February 2011. As of January 2011, fuel channel installation in Unit 2 was complete. The Canadian Nuclear Safety Commission gave the operator the green light to restart Unit 2 on 16 March 2012. However, the reactor was shut down the next day after a leak was discovered in the moderator system. In 2011, refurbishment of Unit 1 and 2, scheduled to be complete 2009, was predicted for 2012. In 2011, the cost had totaled $3.8 billion; the final cost was expected to be $4.8 billion. The original 2005 estimate was $2.75 billion. In September 2012, Unit 1 began generating power again. On 16 October 2012, Unit 2 was connected to the provincial electricity grid for the first time in 17 years. In 2013, final costs were estimated at $4.8 billion, up from an original estimate of $2.75 billion, and the project ran "far behind" schedule. In October 2013, under the Ontario Long Term Energy Plan (LTEP) 2013, Ontario announced plans to refurbish six reactors at the Bruce plant beginning with Bruce A4 in 2016. Other units would follow at intervals. Bruce Power estimated the cost at about $2 billion per unit, or $12 billion for six. The price of the power from these units was expected to be in the range of ~$60–$70 per MWh. In 2016, Bruce Power started a $13 billion refurbishment program for "major component replacement on Units 3–8 in 2020, starting in Unit 6". According to Bruce Power, this multi-year plan "will generate between 1,500 and 2,500 jobs on site annually – and 18,000 across Ontario directly and indirectly – while injecting up to $4 billion annually into Ontario's economy". Renew Canada rated the project as the biggest infrastructure upgrade in Canada for 2017. The Bruce station area is the site of OPG's Western Waste Management Facility (WWMF). The WWMF stores the low-level waste and intermediate level nuclear waste from operating its 20 nuclear reactors, including those leased to Bruce Power. As of 2009, there were 11 low level storage buildings. The WWMF provides dry nuclear fuel storage for the Bruce reactors. The Nuclear Waste Management Organization was mandated in 2002 by the Nuclear Fuel Waste Act to submit a proposal for the long-term management, which was submitted to the Minister of Natural Resources in November 2005 and approved by the government in June 2007. As of May 2017[update] it is seeking a separate site in Canada for a permanent repository for the used fuel from all of Canada's nuclear reactors. In 2013, OPG proposed to construct a Deep Geologic Repository (DGR) for long-term storage of low-and-intermediate level waste on lands adjacent to WWMF. The proposed DGR would be about 680 metres below surface. In 2007, the Ontario Power Authority had recommended in a plan submitted to the Ontario Energy Board, to build a new nuclear power station consisting of at least two reactors. The leading candidate was AECL's Advanced CANDU Reactor. Since 2008, environmental assessments have been underway both at Bruce and at Ontario Power Generation's Darlington Nuclear Generating Station. In 2009, Bruce Power withdrew its application to the Canadian Nuclear Safety Commission (CNSC) for the Bruce C plant. There are more than 56 kilometres of roads on site, and at least 25 major structures. The site has its own fire department, laundry and medical centre. Encompassed by the Bruce site is the shut-down Douglas Point reactor, an earlier version of the CANDU design. Construction began in 1960; was operational in 1967; and was shut down in 1984. The present Bruce reactors each are roughly 4 times the capacity of the 200 MW Douglas Point unit. The Bruce Heavy Water Plant (BHWP) also occupied the site. Atomic Energy of Canada Limited contracted the Lummus Company of Canada Limited in 1969 to design and construct the first phase of the plant, while Ontario Hydro was responsible for commissioning and operating. D was 70% completed when cancelled, and subsequently demolished in 1995. During its lifetime, BHWP produced 16,000 tonnes of reactor grade heavy water. Capacity of each sub-plant was planned to be 800 tonnes/annum. The plant size was approximately 960 m by 750 m. The heavy water was 99.75% pure. The production of a single pound of heavy water required 340,000 pounds of feed water. The heated water released back into Lake Huron by the plant prevents the surrounding shoreline from freezing over during winter and attracts an inordinate concentration of lake fish, which in turn attracts droves of bald eagles wintering in the area. Numbers peak around late February to early March and it is not uncommon for visitors to observe several dozen eagles in and around the general vicinity of the plant at any given time during these months. In 1977, three Greenpeace activists canoed into the site to demonstrate the lack of security. On 23 September 2001, a man whose boat capsized on Lake Huron near the Bruce complex squeezed through a gate, entered an office building and phoned for help—all undetected. The pre-9/11 mandate of the security team was to delay attackers for 17 minutes, until local police could respond. Reliance was on passive measures such as fencing and locks. The "transformed" post 9/11 security team is described as being larger than the police force of the city of Kingston, i.e. equivalent to the force of a city of 100,000. Force members are permitted to carry firearms, and have powers of arrest. The force possesses armoured vehicles, water craft, and the plant is now triple-fenced. In May 2008, the Bruce Nuclear Response Team (NRT) won the U.S. National SWAT Championship (USNSC), defeating 29 other teams from 4 countries, the first time a Canadian team won an international SWAT event. They won again in 2009, 2010, and 2011. In 2010, about 40 contract workers were fired or suspended for inappropriate internet usage. Post 9/11, tours of the plant area were discontinued, although there is a visitor centre outside of the site. According to the Bruce County emergency plan, "The Municipality of Kincardine will coordinate the emergency response concerns of a nuclear emergency situation resulting from an accident at the Bruce Power Site in the Municipality of Kincardine". Kincardine is required to maintain a warning system within 3 km of the plant, and has a network of 10 warning stations equipped with sirens and strobes. A variety of radiation monitoring measures are in place. Milk samples from local farms are sampled weekly. Drinking water at treatment plants in Kincardine and Southampton is sampled twice daily, and tested weekly. Ground water is sampled from several surface water, shallow and deep well locations. Aquatic sediment and fish are analysed, as well as livestock feed, honey, eggs, fruits and vegetables. ^ a b c d "Global Security Article" (PDF). Retrieved 22 March 2011. ^ "Bruce Power About Us". Bruce Power. ^ a b c d e f g h "Bruce A Refurbishment". Bruce Power (Golder Associates). December 2004. Archived from the original on 24 November 2010. Retrieved 22 March 2011. ^ steveheiser (5 November 2009). "Bruce Power Gets Five-Year Operating Licences - Nuclear Power Industry News - Nuclear Power Industry News - Nuclear Street - Nuclear Power Portal". Nuclear Street. ^ "CNSC Extends Bruce Power's Operating Licence Until May 2015". Government of Canada, CNSC. Retrieved 17 August 2014. ^ "Canadian Nuclear Safety Commission renews Bruce Power's power reactor operating licences". Government of Canada, CNSC. Retrieved 5 June 2015. ^ a b c d Gord L. Brooks (December 2002). "A Short History of the CANDU Nuclear Power System, Revision 2" (PDF). Canteach. Archived from the original (PDF) on 23 July 2011. Retrieved 25 March 2011. ^ Huterer, J.; Brown, D.G. ; Osman, M.A. ; Ha, E.C. (2 February 1987). "Nuclear Engineering and Design - Pressure relief structures of multi-unit candu nuclear power plants". Nuclear Engineering and Design. 100: 21–39. doi:10.1016/0029-5493(87)90069-0. Archived from the original on 19 September 2012. ^ a b c d e f g h "Reporter's Guide to Bruce Power (Revision 4)" (PDF). August 2007. Archived from the original (PDF) on 1 April 2010. Retrieved 24 March 2011. ^ Daams, Dr. Johanna. "Nuclear Reactor Containment Design (chapter 3, module A)" (PDF). canteach.candu.org. Retrieved 28 June 2018. ^ Pitre, John; Chan, Peter; Dastur, Adi. "Candu physics considerations for the disposition of weapons-grade plutonium" (PDF). AECL. Retrieved 29 July 2017. ^ a b John M. Dyke & Wm. J. Garland (19 May 2006). "Evolution of CANDU Steam Generators – a Historical View" (PDF). Canteach. Archived from the original (PDF) on 1 July 2014. Retrieved 26 March 2011. ^ W. Dickie (June 2006). "Bruce Nuclear Generating Station 2006 Safety Report, Revision 15" (PDF). ^ a b c d e f g Ontario Nuclear Safety Review (29 February 1988). "The Safety of Ontario's Nuclear Power Reactors (Vol 2 Appendices)" (PDF). Toronto, Ontario. p. 581. Retrieved 31 March 2011. ^ a b c "About Us Bruce Power | Bruce Power". www.brucepower.com. 25 August 2015. Retrieved 19 February 2017. ^ a b c d "PRIS - Reactor Details". www.iaea.org. Retrieved 29 July 2017. ^ a b c "Bruce 1 generates power for the first time in 15 years". Nuclear Engineering International. 24 September 2012. Archived from the original on 30 January 2013. Retrieved 8 October 2012. ^ a b c d Morgan Brown (25 November 2009). "Canada's Nuclear History Chronology". Canadian Nuclear Society. Retrieved 31 March 2011. ^ a b "Bruce A Proves There Are Second Acts in Nuclear Power". Power Magazine. 1 August 2010. Retrieved 27 March 2011. ^ "CANDU Flawed". Maclean's Magazine. The Canadian Encyclopedia. Retrieved 26 March 2011. ^ Keith Stewart (24 March 2011). "The Billion Dollar "oops" at the Bruce Nuclear Station". Greenpeace. Archived from the original on 26 March 2011. Retrieved 27 March 2011. ^ a b c d e "PRIS - Reactor Details". www.iaea.org. Retrieved 29 July 2017. ^ a b c d e f g "Achieving Balance: Ontario's Long-Term Energy Plan" (PDF). Ontario Government. Archived from the original (PDF) on 25 March 2014. Retrieved 27 July 2014. ^ a b c d e f "Bruce Power's Role In Ontario" (PDF). Bruce Power. Archived from the original (PDF) on 22 February 2017. Retrieved 21 February 2017. ^ a b c d e f "Re: NERA Economic Consulting's Opinion as to the Fairness of the Amended and Restated Bruce Power Refurbishment Implementation Agreement" (PDF). NERA Economic Consulting. Archived from the original (PDF) on 22 February 2017. Retrieved 21 February 2017. ^ Garrett, Chris & Apostolakis, George. "CONTEXT AND SOFTWARE SAFETY ASSESSMENT" (PDF). p. 49. Retrieved 17 August 2014. ^ a b "Bruce Power: Site History". Canadian Nuclear Workers' Council (CNWC). 2009. Archived from the original on 27 May 2011. Retrieved 27 March 2011. ^ a b c d "Better Never Than Late" (PDF). Greenpeace. October 2008. Archived from the original (PDF) on 24 September 2015. Retrieved 4 April 2011. ^ "CNA Nuclear Energy Booklet 2008" (PDF). Canadian Nuclear Association. Archived from the original (PDF) on 28 September 2011. Retrieved 27 March 2011. ^ "CNA Nuclear Energy Booklet 2010" (PDF). Canadian Nuclear Association. 2010. Archived from the original (PDF) on 6 July 2011. Retrieved 27 March 2011. ^ a b c "PRIS - Reactor Details". www.iaea.org. Retrieved 29 July 2017. ^ "Bruce Power's 2013 Annual Review" (PDF). Bruce Power. Retrieved 27 July 2014. ^ "The World's Largest Power Plants". Archived from the original on 6 October 2012. Retrieved 26 March 2011. ^ "Nuclear Power in Canada". Canadian Nuclear Association. 2010. Archived from the original on 26 August 2011. Retrieved 27 March 2011. ^ "The Need for More Transmission in Bruce Region". Ontario Power Authority. Retrieved 18 April 2008. ^ "Ontario's Long-Term Energy Plan" (PDF). OPA. 2010. Archived from the original (PDF) on 19 August 2014. Retrieved 26 March 2011. ^ McCallum, Douglas. "Bruce to Milton Transmission Line Completed Six Months Ahead of Schedule". Retrieved 17 August 2014. ^ "Bruce Power got millions to not produce electricity". CTV News. 21 September 2010. Retrieved 22 March 2011. ^ Foster John S. & Brooks G.L. (February 2001). "CANDU ORIGINS AND EVOLUTION - PART 1 OF 5 AN OVERVIEW OF THE EARLY CANDU PROGRAM PREPARED FROM INFORMATION PROVIDED BY JOHN S. FOSTER" (PDF). Canteach. Retrieved 27 July 2014. ^ Howieson J.Q. & Snell V.G. "Chernobyl - A Canadian Technical Perspective" (PDF). Canteach / AECL. Retrieved 27 July 2014. ^ Simmons, R.B.V. "Nuclear Power Symposium Lecture No. 10: Plant Layout" (PDF). Atomic Energy Of Canada Limited (AECL). Retrieved 20 August 2017. ^ Brooks G.L. (February 2001). "CANDU ORIGINS AND EVOLUTION PART 5 OF 5 THE ORIGINS & EVOLUTION OF THE SECOND SHUTDOWN SYSTEM" (PDF). CANTEACH. Retrieved 27 July 2014. ^ Atomic Energy of Canada Limited (1997). Canada enters the nuclear age. ISBN 978-0-7735-1601-4. ^ "Appendix 2 Ontarioís Nuclear Generating Facilities: A History and Estimate of Unit Lifetimes and Refurbishment Costs" (PDF). pembinafoundation.org. Retrieved 26 June 2018. ^ Bruce Power. "Amended Agreement Secures Bruce Power's Role In Long-Term Energy Plan". www.brucepower.com. Retrieved 3 March 2016. ^ a b An Assessment of the Financial Risks of the Nuclear Refurbishment Plan (Report). Financial Accountability Office of Ontario. 21 November 2017. ISBN 978-1-4868-0925-7. Retrieved 27 June 2018. ^ Carvalho, V.F. ; Acchione, P.N. (December 1986). "Performance of Nuclear Unit Controls in Grid Emergency Situations". IFAC Proceedings Volumes. 19 (16): 161–168. doi:10.1016/S1474-6670(17)59375-1. ^ a b "Canadian Nuclear Worker" (PDF). Canadian Nuclear Workers Council. June 2017. p. 3. Retrieved 9 August 2017. The following day, Bruce Power announced the completion of a Cobalt-60 harvest during the Unit 5 outage. Following the harvest, new rods of Cobalt-59 (becomes Cobalt-60 after up to two years in the reactor) were inserted in Unit five along with four rods of medical High Specific Activity Cobalt which is used to treat brain cancer. ^ "The Canadian Nuclear Factbook 2017" (PDF). Canadian Nuclear Association. Retrieved 9 August 2017. ^ Gowan, Rob (17 November 2014). "Bruce Power to produce Cobalt-60". Owen Sound Sun Times. Owen Sound Sun Times. Archived from the original on 9 August 2017. Retrieved 9 August 2017. ^ "The Role of Nuclear: Present and Future" (PDF). pp. 3–4. Retrieved 9 August 2017. ^ "Bruce Power: Canada's Largest Public-Private Partnership" (PDF). August 2015. p. 22. Retrieved 9 August 2017. Unrelated to refurbishment, yet extremely innovative work that takes during planned maintenance outages, is the Cobalt-60 harvest. Working together, Bruce Power and Nordion provide a reliable, long-term, end-to-end Cobalt-60 supply, which fuels gamma processing operations such as irradiation facilities that sterilize single-use medical devices. Cobalt is mined like any other mineral. It's removed from the ground and processed into pure Cobalt-59 powder. Once processed into powder, it's compressed into slugs, which are coated with nickel. These slugs are then encapsulated and assembled into adjuster rods, which are used to control the reaction in Bruce Power's reactors, where the cobalt is activated by absorbing neutrons to become Cobalt-60. The rods are in the reactor for a minimum of one year and maximum of 2.5 years. Bruce Power harvests the rods during planned maintenance outages on the units. The bundles are then received by Nordion and the Cobalt-60 is removed from its encapsulation and welded into a new double-encapsulated source called C-188. It is then shipped to the sites of Nordion's customers for use in irradiators. In 2014, Bruce Power and Nordion signed an agreement for up to an additional 14 years to provide a long-term supply of Cobalt-60 that will support health care around the world. Cobalt-60 makes an invaluable contribution to the health care industry and is used to sterilize approximately 40 per cent of all single-use medical devices and equipment produced globally. ^ "Nordion and Bruce Power ensure global Cobalt-60 supply up to 2064". 8 November 2016. Retrieved 9 August 2017. ^ "Nuclear Power in Canada - World Nuclear Association". www.world-nuclear.org. World Nuclear Association. Retrieved 9 August 2017. As well as their use for electricity, Candu power reactors produce almost all the world's supply of the cobalt-60 radioisotope for medical and sterilization use. ^ Vulcan, Tom (19 April 2010). "Radioisotopes: A Market In Decay? | ETF.com". www.etf.com. Retrieved 9 August 2017. ^ a b c d "Canadian companies collaborate to secure isotope supplies". www.world-nuclear-news.org. World Nuclear News. 8 November 2016. Retrieved 9 August 2017. ^ "Clean Nuclear Power | Safe Hospitals". www.cleannuclearpowersafehospitals.com. Retrieved 9 August 2017. ^ "Reprieve for Canadian isotope reactor". world-nuclear-news.org. World Nuclear News. 9 February 2015. Retrieved 9 August 2017. ^ "Canadian companies join up for medical isotope development". www.world-nuclear-news.org. World Nuclear News. 29 October 2015. Retrieved 9 August 2017. ^ a b Jones, Kristie. "Partnership ensures stable supply of medical grade cobalt". hospitalnews.com. Hospital News. Retrieved 9 August 2017. ^ a b Brown, C (1 March 2016). "Will new isotope sources be ready in time?". CMAJ : Canadian Medical Association Journal. 188 (4): 252. doi:10.1503/cmaj.109-5224. PMC 4771533. PMID 26811359. ^ a b Kveton, Adam (16 November 2015). "Nordion to get cancer-treating isotope from Bruce Power | OttawaCommunityNews.com". OttawaCommunityNews.com. Kanata Kourier-Standard. Retrieved 9 August 2017. ^ Nordion (1 February 2016). "A Billion Curies and Counting: 50 years of Canadian nuclear innovation in healthcare" (PDF). Canadian Nuclear Society. p. 30,35. Retrieved 9 August 2017. ^ "OPG's Update to Municipal Councils in Bruce County Q2 – 2017" (PDF). Ontario Power Generation. Archived from the original (PDF) on 9 August 2017. Retrieved 9 August 2017. ^ "Bruce Power wins Innovation Award". Kincardine News. 25 May 2017. Archived from the original on 9 August 2017. Retrieved 9 August 2017. ^ "Top Innovative Practice Awards 2017". Nuclear Energy Institute. Retrieved 20 August 2017. ^ "Bruce Power and AREVA NP Expand Agreement for Commercialization of Radioisotope Production - AREVA NP - AREVA Group". us.areva.com. 8 August 2017. Archived from the original on 9 August 2017. Retrieved 9 August 2017. ^ a b "Bruce Power, Areva NP join for isotope production". www.world-nuclear-news.org. World Nuclear News. 9 August 2017. Retrieved 9 August 2017. ^ "Bruce Power and ITM to supply cancer therapy isotope". www.world-nuclear-news.org. 29 June 2018. Retrieved 30 June 2018. ^ "Government and Bruce Power Reach Agreement to Restart Nuclear Units". Queen's Park, Ontario: Canadian Ministry of Energy. 17 October 2005. Archived from the original on 25 February 2010. Retrieved 18 April 2008. ^ "TransCanada to Invest in $4.25 Billion Bruce Power Restart and Increase Its Interest in Bruce A". Calgary, Alberta: Marketwire. 17 October 2005. Archived from the original on 13 May 2008. Retrieved 18 April 2008. ^ Gray, S.F. & Basu, S. "Turbine control system upgrade for Bruce Nuclear plant units 1 and 2 (Abstract)". IEEE Xplore. Retrieved 27 July 2014. ^ "ReNew Canada - The Top 100". Archived from the original on 21 March 2008. Retrieved 2008-04-18. ^ Office of the Auditor General of Ontario (5 April 2007). "The Bruce Power Refurbishment Agreement" (PDF). Archived from the original (PDF) on 27 May 2011. Retrieved 27 March 2011. ^ Tyler Hamilton (18 April 2008). "Reactor repairs confirmed over budget". The Toronto Star. Retrieved 18 April 2008. ^ "Bruce Nuclear radiation incident shows safety gap". CTV News. 18 February 2010. Retrieved 24 March 2011. ^ Popplewell, Brett (11 July 2010). "Critics slam proposal to ship nuclear waste through Lake Ontario". The Star. Toronto. ^ "Bruce Power granted licence to transport steam generators". 4 February 2011. Archived from the original on 13 November 2006. Retrieved 26 March 2011. ^ "Bruce Power – Bruce A Unit 2 Completes Installation of 480 New Fuel Channels - Nuclear Power Industry News - Nuclear Power Industry News - Nuclear Street - Nuclear Power Portal". Nuclear Street. 26 January 2011. ^ Reuters (16 March 2012). "Bruce Power gets nod to restart Ontario reactor". Edmonton Journal. Edmonton. Archived from the original on 21 March 2019. Retrieved 19 March 2012. ^ QMI Agency (19 March 2012). "Leak discovered at nuclear plant". London Free Press. London, Ontario. Retrieved 19 March 2012. ^ Spears John (20 January 2013). "Darlington nuclear refit will have two outside overseers". Toronto Star. Retrieved 24 March 2013. ^ "Long-Term Energy Plan Brief October 2013" (PDF). Bruce Power. Retrieved 27 July 2014. ^ Learment, Frances (28 February 2017). "Bright future for Saugeen Shores". Shoreline Beacon. Southampton, Ontario. Archived from the original on 9 March 2017. Retrieved 8 March 2017. ^ "Unit 1 sets new post-refurbishment long run record". Bruce Power. Bruce Power. 14 April 2016. Retrieved 8 March 2017. ^ "Top 100 Canada's Biggest Infrastructure Projects". Retrieved 28 June 2018. ^ "Western Waste Management Facility" (PDF). Ontario Power Generation. Archived from the original (PDF) on 12 June 2011. ^ "Ontario Power Generation: Power Generation: Nuclear Waste Management". Opg.com. n.d.
^ "Power plan calls for Ontario to spend $26.5B on nuclear plants". CBC News. 29 August 2007. Retrieved 18 April 2008. ^ David Olive (14 April 2008). "Queen's Park prepares for 'power' play". Toronto Star. Retrieved 18 April 2008. ^ Tyler Hamilton (8 April 2008). "GE-Hitachi won't bid for reactor". Toronto Star. Retrieved 18 April 2008. The government plans to pick a winning technology by the end of the year. It also will decide by that time whether the plant will be located in Clarington or Bruce County, and whether the plant's operator will be Ontario Power Generation or Bruce Power. ^ Frank Saunders (23 July 2009). "Withdrawal of Application... [Letter]" (PDF). CNSC. Retrieved 26 March 2011. ^ steveheiser (24 July 2009). "Bruce Power Will Focus On Additional Refurbishments At Bruce A And Bruce B". Nuclear Street. ^ a b Davidson, G. D. (1978). "Bruce Heavy Water Plant Performance". Abstract for "Separation of Hydrogen Isotopes". ACS Symposium Series. 68. American Chemical Society. pp. 27–39. doi:10.1021/bk-1978-0068.ch002. ISBN 978-0-8412-0420-1. ^ "Heavy Water Production". Federation of American Scientists. Retrieved 27 March 2011. ^ Jürgen Kupitz (March – April 2000). "Small and Medium Reactors: Development Status and Application Aspects" (PDF). IAEA. p. 38. Retrieved 27 March 2011. ^ "Nuclear heat applications: World overview" (PDF). IAEA. Archived from the original (PDF) on 5 September 2012. Retrieved 27 March 2011. ^ "Introduction to CANDU processes" (PDF). Archived from the original (PDF) on 23 July 2011. Retrieved 27 March 2011. ^ Ontario Ministry Natural Resources (OMNR) (2007). "Inverhuron Draft Vegetation Management Plan" (PDF). Queen's Printer for Ontario. p. 42. Retrieved 4 April 2011. ^ "John Bennett | Sierra Club Canada". Sierraclub.ca. Archived from the original on 25 February 2011. ^ Tony Manolatos (24 July 2002). "Nuke foes fight expansion of Canadian plant" (PDF). The Detroit News. Retrieved 4 April 2011. ^ "Ontario Hansard - 10-October2001". 10 October 2001. Retrieved 4 April 2011. ^ "Blue Line Forums • View topic - nuclear plant security". Forums.blueline.ca. ^ "98 The Beach News". 98thebeach.ca. ^ "US National SWAT Championship". Archived from the original on 26 November 2010. Retrieved 24 March 2011. ^ "US National SWAT Championship". Archived from the original on 7 November 2011. Retrieved 7 November 2011. ^ nurun.com (11 September 2009). "Bruce Nuclear contractors fired, suspended over... | Canada | News". Peterborough Examiner. Archived from the original on 13 September 2012. ^ Hamilton, Tyler (10 September 2009). "Dozens fired at Bruce Power over Web, e-mail use". The Toronto Star. Retrieved 24 March 2011. ^ "COUNTY OF BRUCE EMERGENCY RESPONSE PLAN". 2004. p. 1.2.3. Archived from the original on 22 December 2010. Retrieved 24 March 2011. ^ "Municipality of Kincardine Public Alerting System" (PDF). Archived from the original (PDF) on 19 August 2011. Retrieved 25 March 2011.